Some of the world’s largest single-celled organisms come from TCI. The islands of Turks & Caicos are home to many astonishing flora and fauna. Today I would like to introduce four very special species of TCI algae to you: the sailor’s eyeball (Valonia ventricosa), the mermaid’s wine glass (Acetabularia crenulata) the cactus tree alga (Caulerpa cupressoides) and the feather alga (Caulerpa sertularioides). These algae always amaze our students at the School for Field Studies in South Caicos, because they are some of the largest single-celled organisms on earth! The fronds of the feather alga come from a single cell with many nuclei. A single-celled organism, as the name says, consists of just one cell. We humans, in comparison, have about 37.2 trillon cells in our body which all have their own function such as skin cells, brain cells and blood cells. Most single-celled organisms are small and blob-like and you can only see them under the microscope. This is definitely not the case for these four interesting algae that you can find snorkeling in the waters of the Turks & Caicos Islands! The sailor’s eyeball was named by early mariners, who, peering into the water, thought they looked like eyes peering back at them. They are round and green in color and the surface of the cell shines like glass. This is why they are also often called sea pearls. But not only mariners were fascinated by the sailor’s eyeball—these large, unicellular algae have intrigued cell biologists and electrophysiologists since the early twentieth century. So how big can this single-celled alga get? Up to the size of a tennis ball! 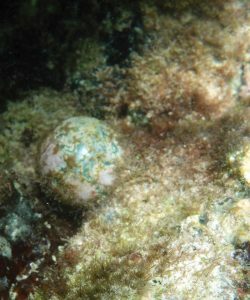 The sailor’s eye ball is a single-celled alga that can grow to the size of a tennis ball. The inside of the sailor’s eyeball is jam-packed with different organelles such as chloroplasts, which use the sun to produce energy for the alga through photosynthesis. Even though it is a single cell, it does have multiple nuclei, which contain the genetic material. These nuclei are arranged in a fixed pattern with chloroplasts and smaller organelles around them. Therefore the inside of the sailor’s eyeball looks like a lot of small cells that are interconnected, rather than separated, by cell walls. Because the sailor’s eyeball is such a large cell, it has been used by scientists to study the transfer of water and other fluids across biological membranes. These studies help us understand more about cellulose, the main component of the cell walls of algae and plants. On top of that, the sailor’s eyeball also has an unusual high electrical potential relative to the seawater around it. Why this alga is so “electric” is still not entirely known and fascinates electrophysiologists. While the sailor’s eyeball is formed like a ball, the mermaid’s wine glass resembles more a wine glass or cup. This form makes it even more difficult to believe that this alga consists just of a single cell. But these green natural wine glasses, are made in one piece from foot to lip or from rhizoid to cap as these parts are called in the alga. Unlike the sailor’s eyeball, the mermaid’s wine glass only has a single nucleus. 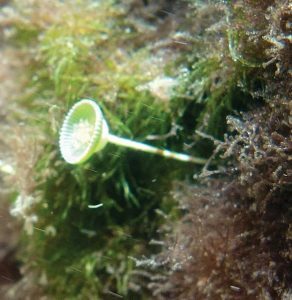 Despite being single celled, this alga has distinct body regions and goes through phase changes similar to vascular plants. The zygote (similar to a fertilized egg cell in animals/humans or a seed in plants) germinates and attaches to the substrate. Soon, parts of the cell take up their distinct forms—the middle of the cell elongates and grows into the stalk of the alga, with whirls of hair forming on its top. At the same time, the base of the cell turns into a branched rhizoid that contains the nucleus and holds the cell in place on the substrate. When the cell reaches its final length of up to 10 cm!, a cap is formed at the top rather than new whirls of hairs. During its development, the zygote increases its volume by 25,000—that is like a single glass of wine turning into 20 barrels of wine! Because of its large nucleus, the mermaid’s wine glass has helped us understand how cellular development and transplantation of nuclei work. In the 1930s, Joachim Haemmerling discovered that when he cut this alga in half, the bottom part of the alga would regrow while the top part withered away. He discovered that the nucleus is responsible for cell development. Lastly, TCI is home to the cactus tree alga and the feather alga, which are both in the genus Caulerpa, the largest free-living, single-celled organisms in the world. The largest Caulerpa, the Hawaiian native Caulerpa taxifolia, was given the nickname “killer algae” after it invaded the Mediterranean waters. An individual Caulerpa (thus an individual cell!) spreads its runners over the sea floor, growing to 3 meters in length! From these runners, fronds up to 60–80 cm in length grow upwards, and root-like holdfasts anchor the runners to the ground. 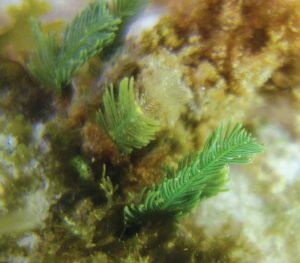 The fronds have intrinsic designs, resembling cactuses and feathers in the algae found in the TCI. The mermaid’s wine glass consists of a single cell with distinct body regions and phase changes. So like the mermaid’s wine glass, these single-celled algae take up complex forms. Like the sailor’s eyeball, the cactus tree alga and feather alga harbor many nuclei in their single cell. Scientists think that the complex forms of these algae come from different genes being expressed in the different parts of the plants. These single-celled algae show that forms resembling the basic form of land plants, roots, stems and leaves do not need multiple cells to form. Some scientists even think that because cells of higher plants such as the tomato are connected to each other by channels, that they are very similar to these single-celled algae with many nuclei that are not divided from each other by cell walls. Besides being astonishing, these algae really help us understand our land plants better. Next time you are snorkeling on a beautiful TCI reef, look out for these giant single cells and see how easy it is to spot them without a microscope.